In Tanzania's Serengeti National Park (especially in the dry season), you are absolutely guaranteed to see most of the animals from your childhood ABC's book. With the right guide, a comfortable jeep, and nice warm day, a 10-hour trek through the Serengeti (the Maasai word meaning 'Endless Plains') will blow your mind. These three giraffes were born at almost exactly the same time around six months ago to three separate mothers in their coalition. 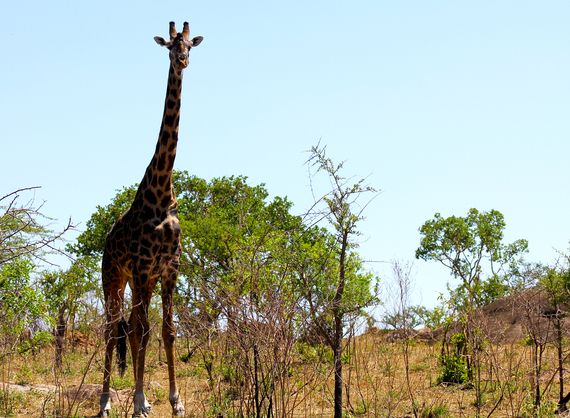 Giraffes are extremely social animals, but their groups are ever-changing. The strongest bonds of all are between mothers and offsprings followed closely by giraffe babies with each other. These three giraffes are a tight bunch, meaning their mothers will also stay together for months during their upbringing. Although the key element in the term 'wild animals' is the word 'wild,' safari-goers are often shocked at the nonchalance some of the Serengeti's creatures exhibit towards the jeeps and their occupants. This is known as habituation, meaning a decreased response to stimuli due to repeat exposure. 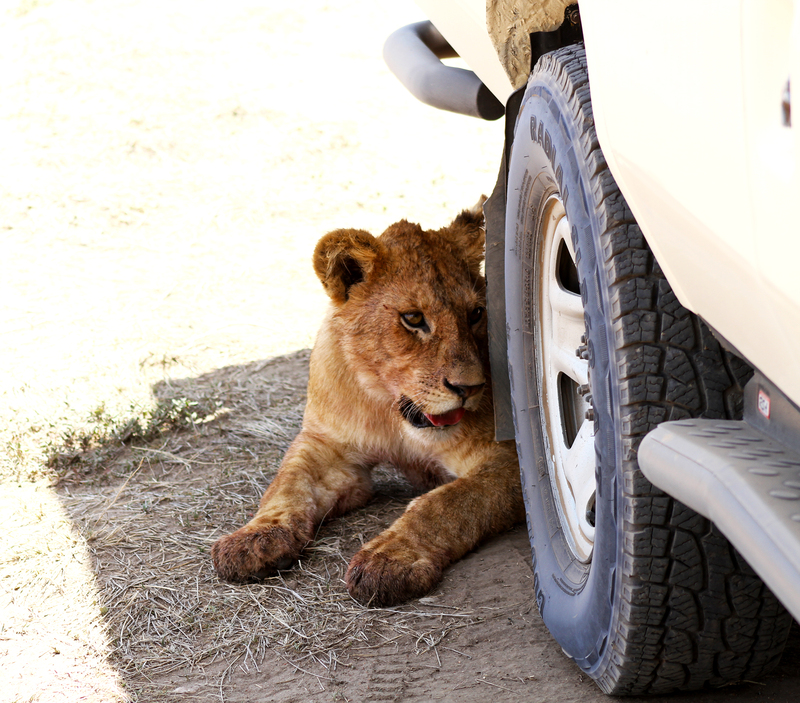 This male lion cub (about a year old) has grown up seeing safari jeeps every day of his life, and sees them as just another aspect of his day (neither threatening nor interesting). In the heat of the midday sun the shadow cast by the jeep is much more appealing to the lion cub than the jeep itself. The Serengeti is the perfect place for the study of lion behavior, and in the foreground of this shot of a zebra kill you can see the tracking collar placed around a senior female in this pride. 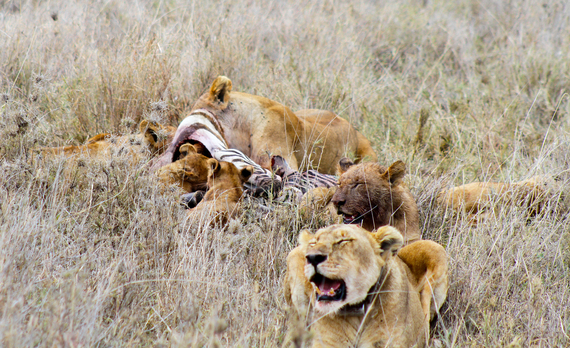 Her sister had recently given birth to four healthy lion cubs, two of which are visible in this image (the third and fourth are feeding behind the carcass and out of view). Our guide was able to watch their progress each day his guests would come across this pride while on a Serengeti drive. This was the very first time our guide had seen the cubs dive into a fresh kill, for what he called "their very first meat." This is Uncle Freddy, who's been a lifelong resident of Migration Camp in the north of Serengeti National Park. He was born near the camp which caters to safari-goers year round, and therefore Uncle Freddy has no fears associated with standing near to the guests. In fact this image was taken from my camera with no zoom while I was standing directly in front of him. Personally, I've only witnessed this type of behavior from giraffes housed or raised in a sanctuary. For a completely wild giraffe this is quite an amazing sight. Uncle Freddy often sleeps next to the guests' safari tents (he slept next to mine the night before this image was taken) because he enjoys the safety provided by the camp's 'predator-free zone' (the big cats give Migration Camp a wide berth because they dislike being close to human habitation). 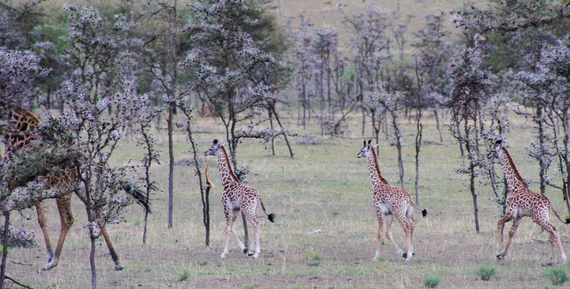 The local guides say that Uncle Freddy has been trying to convince his 'giraffe-friends' to also hang out closer to the camp, and I wish him the best of luck with that. 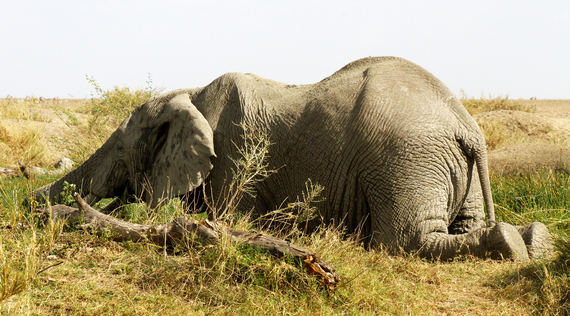 Elephants spend an astonishing 18 hours each day feeding on vegetation and grasses. So it's highly likely that when your safari jeep pulls up to an elephant herd they will be in the process of eating something. This large bull male was walking along a ridge over a small creek in Serengeti National Park until he found what he was searching for, the tender grasses growing along specific edges of the creek. To grasp them, he had to crouch down on his knees and reach over the ridge with his massive 300-pound trunk to grab the tender grasses he'd been seeking. Cheetahs are not considered 'group animals' and adults are mostly found living solitary lives. Exceptions to this rule are two to three males who have formed a coalition (hunting/social group which maximizes success at catching prey and defending territories), and mothers who remain with their cubs until they are considered adults. Female cheetahs live solitary lives over what is known as a 'home range.' This is why seeing three adult female cheetahs in a single grouping is a very rare sight. Our guide was able to give us two possible explanations: one was that two of these cheetahs are daughters to the third and are on the verge of leaving their mother and each other to find their own ranges; the second possibility was that these were three sisters who have remained together longer than is usually found in nature, and will almost certainly separate at some point in the future. Pop-culture knowledge tells us that vultures are the last of the scavengers to finish off what remains of the bloated carcasses no other animal will touch. 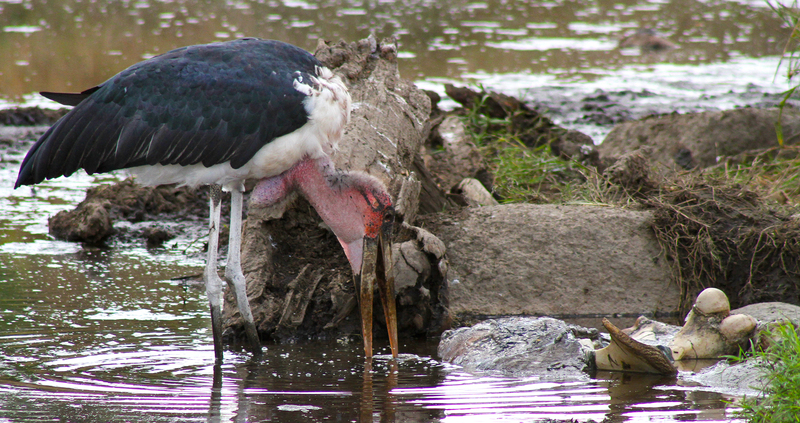 However there is another large bird which lives to eat the material not even vultures consider edible: the marabou stork. Considered one of the most hideous birds in Africa, the marabou is often found in garbage dumps and sites of human refuse eating anything it can fit in its mouth. Here you see an adult marabou stork feeding on the final leftovers of a hippo which had died earlier in the week (the hippo's leg bone is on the right of the image). The vultures picked over the carcass the day before, and what the vultures wouldn't eat was left to the marabous. Secretary birds are some of the most regal animals on the plains of the Serengeti. They march across the savannah with gorgeous plumage and an eye for snakes, their favorite foods. Watching them dispatch an almost certainly venomous snake cloaked in the grasses is quite the event. 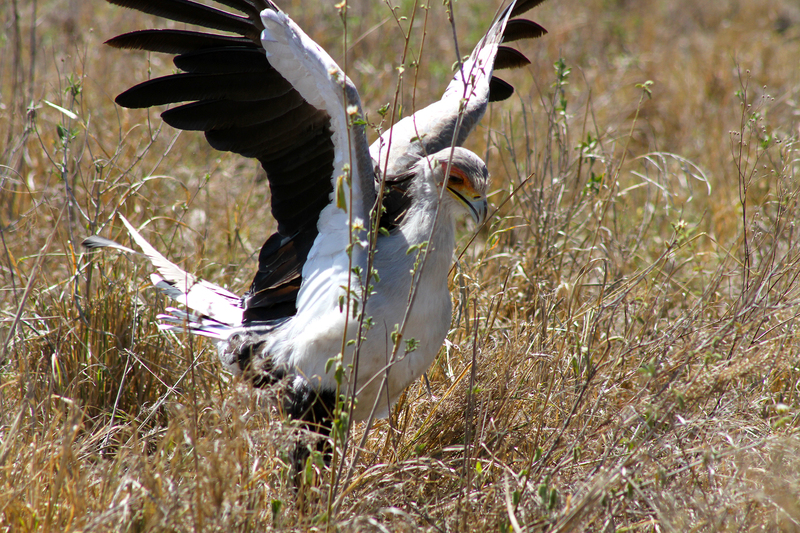 In this image you see a secretary bird as it pounces with raptor claws onto its victim before it swallows it whole. 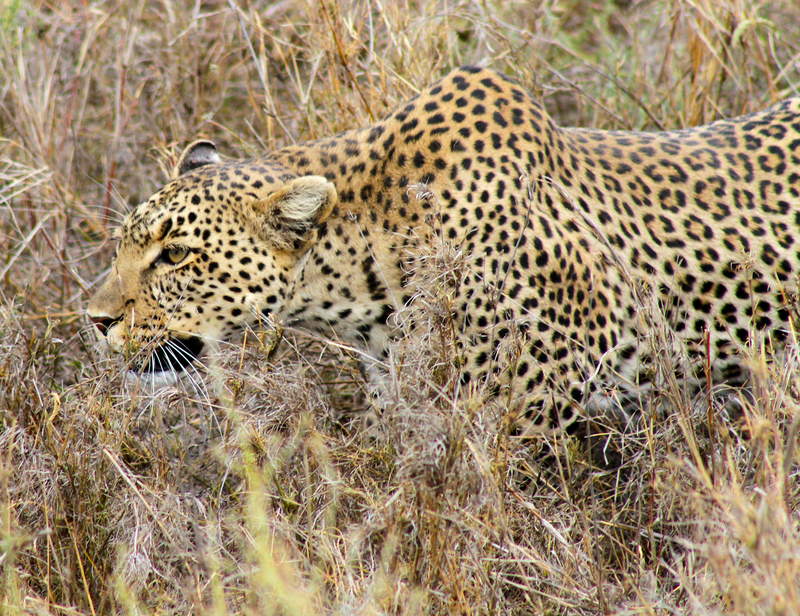 Watching a leopard stalking her prey from start to finish is one of the most amazing events on the wish list of every safari-goer. We watched as this female leopard descended from a tree to begin stalking a lone male thompson's gazelle she'd spotted in the distance. In order to sneak up on her prey she crouched into the 'stalking position,' carefully moving in the direction of the gazelle until she was within striking distance. The result of the leopard's gazelle hunt was not as she probably expected. A small group of adult zebras (animals far too large for an adult leopard to bring down) ended up creating a wall of protection which the gazelle was able to run behind. The threat of a zebra kick to the face (an action which can easily kill a full grown leopard) was enough to cause the female leopard to end her pursuit of the gazelle and admit defeat. She returned to her tree to wait for her next hunting opportunity. All 10 of these animal events happened within one 48-hour period on the Serengeti in drives between Migration Camp in the north of the park and Pioneer Camp in the south of the park. 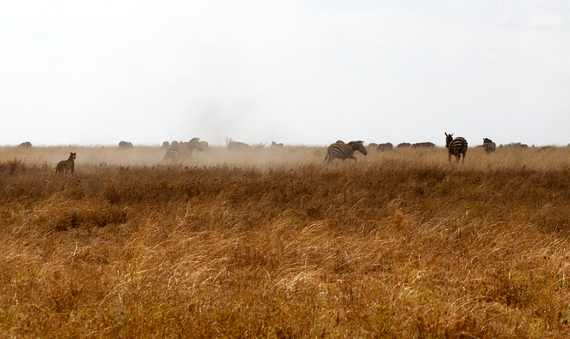 The great thing about the Serengeti is that you never know what you're going to see on your game drives. You're guaranteed to see the park's animals (that much is assured), but what aspects of their lives you'll be able to view changes each and every day, over each and every drive. That's what makes no two trips to the Serengeti the same; each one is totally unique.